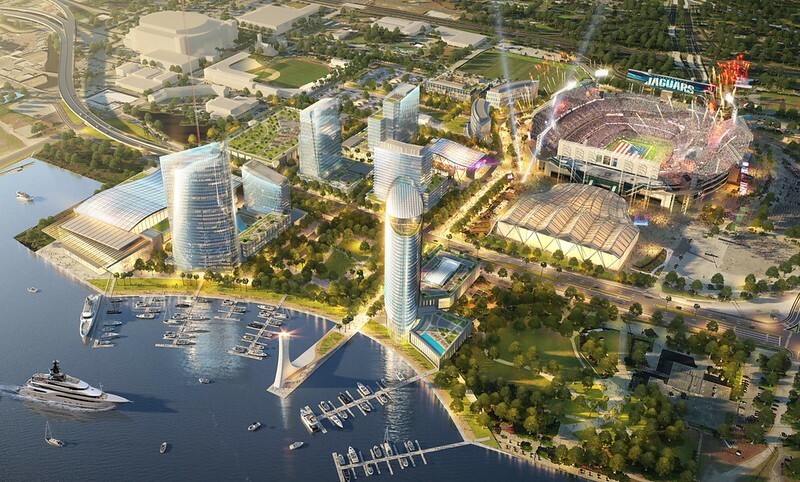 The Jacksonville Jaguars showed off a new set of dazzling renderings for Stadium District developments at the 2018 State of the Franchise. But there are still plenty of hurdles to pass before anything remotely like these plans ever breaks ground. 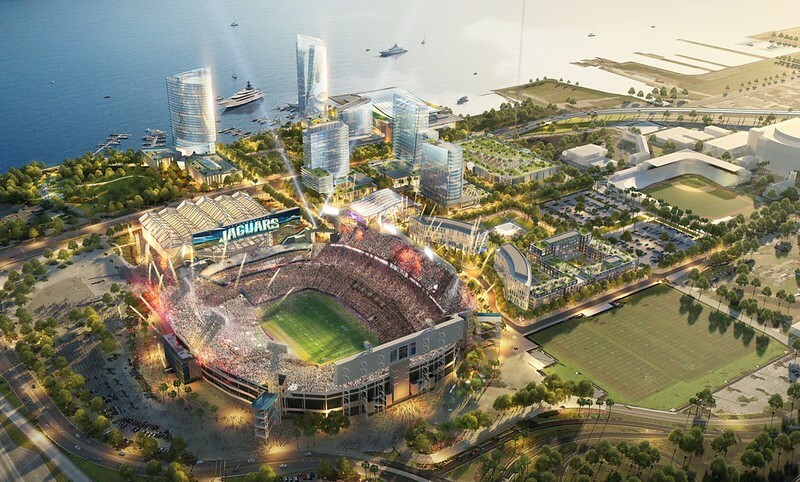 In what has become an annual tradition, on April 19, 2018, the Jacksonville Jaguars devoted part of the annual State of the Franchise to revealing impressive new renderings of developments proposed for what’s now TIAA Bank Field and the surrounding Stadium District. Much of the attention focused on a new development the Jaguars want to install in the present Lot J, between the stadium and Gator Bowl Boulevard. The Jaguars have selected Cordish Companies, creators of the popular Live! brand of entertainment facilities, to develop the project. Renderings show everything from hotels to glass office towers to Jacksonville’s own Live! Arena. As expected, the renderings also show the Hart Bridge ramps removed, with additional development in what is now Metropolitan Park and the western Shipyards property. 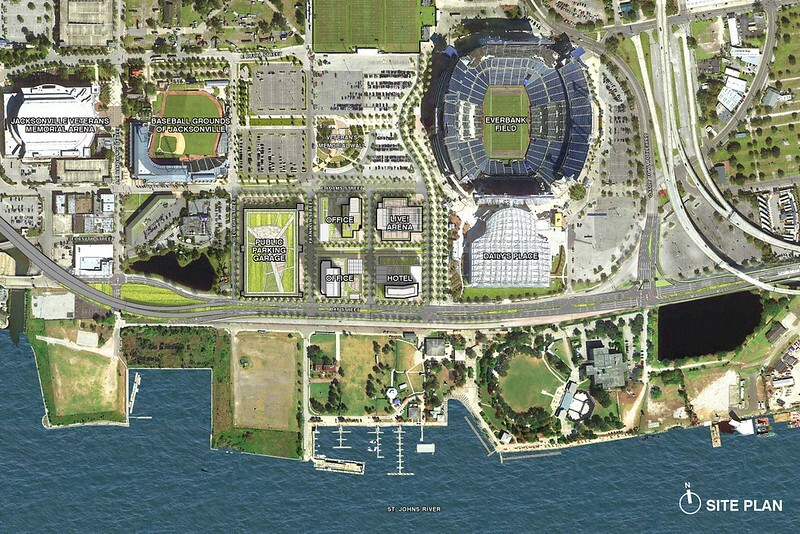 The Jags have been promoting the prospect of development in the Stadium District and Shipyards since early 2015. The major difference this year is that the owners are focusing the bulk of their energies on Lot J, between the stadium and Gator Bowl Boulevard. In many ways, this is a great change - converting a lot that sits empty the vast majority of the year to active space would be a big win for the Stadium District and the urban core, and the renderings are unarguably impressive. But the big reveal included no timeline, and Jags president Mark Lamping’s commentary about the whole thing was measured, focusing on the big picture rather than the nitty gritty details. As such it seems these grand plans are still very much conceptual - and not much closer to coming together now than they were three years ago. Just looking at Lot J, where the Jaguars are now focusing the bulk of their developmental energies, the same hurdles holding back development around the Stadium District and Shipyards are still present. The land is still contaminated from decades of industrial use, and it’s as yet unclear how much cleanup would cost. Additionally, office buildings require tenants, and interest depends on the market. While Downtown’s office vacancy rate is improving, it was still at 12.8% in late 2017 - the market isn’t really bursting with demand for new office towers. And finally, there’s the matter of city funding. While it’s likely the city would chip in for any project as potentially transformative as the one the Jaguars propose, it remains to be seen how much that would involve, and where the money would come from. It would take years for even the more conservative aspects of the plan to reach the planning phase, let alone break ground. Other elements of the plan will be even harder to pull off. Anything south of Gator Bowl Boulevard - Metropolitan Park and the western Shipyards - requires the Hart Bridge ramps finally coming down. While Shad Khan has been working hard with Mayor Lenny Curry and the Duval delegation to make that happen for the last year and half, we’re still trying to scrape the funding together. Then come the other hurdles, including cleaning up contamination, negotiating a land swap with the Federal Parks Service, and financing the developments. That’s not to say that nothing will come of the proposals. Two pieces dating back to the Jaguars’ first Shipyards pitch opened last year, in somewhat different form: Daily’s Place Amphitheater and the indoor practice field. So some pieces of the current renderings could also happen fairly quickly. That includes renovations inside the stadium, such as a third pool, and what’s being billed as the NFL’s first stadium dog park. Some other items also seem fairly likely; for instance, the announcement of a partnership with Cordish Companies implies that a Jacksonville Live! may come along sooner or later. This is an achievable project that could certainly happen with the right amount of money and elbow grease. Indeed, there’s a lot to get excited about in the Stadium District’s future - just don’t expect everything in these stunning renderings to become reality anytime soon. Article by Bill Delaney. Contact moderncitiesusa@gmail.com.